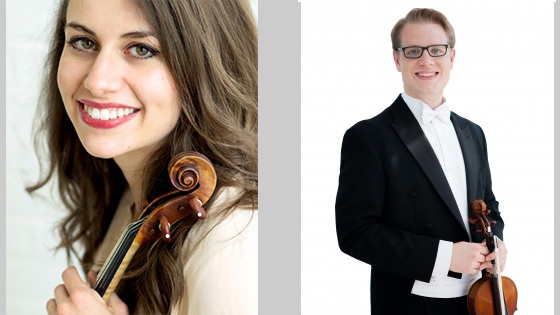 September 19, 2018, 1:00 PM · Violinist Stefani Collins Matsuo was appointed Associate Concertmaster and violinist Philip Marten was appointed First Assistant Concertmaster of the Cincinnati Symphony Orchestra, following auditions that resulted in eight positions being filled in the orchestra, including five string seats. Violinists Stefanie Collins Matsuo and Philip Marten. The new positions are part of an effort to restore the orchestra to its pre-recession size. "An endowment campaign announced in 2015 included 14 newly endowed Orchestra chairs and resulted in a multi-year process to raise the complement to 90 full-time musicians," said an announcement on the Cincinnati Symphony's website. The CSO also added several other string players to its roster, including Charles Morey, Section Second Violin; and Caterina Longhi and Christopher Fischer, both Section Viola. Others appointed were Christopher Pell, Principal Clarinet; Christopher Sales, Principal Bassoon; and Robert Sullivan, Principal Trumpet. Matsuo, who has been a member of the CSO's second violin section since 2015, has a bachelor's degree from the Cleveland Institute of Music and a master's degree from The Juilliard School. She made her solo recital debut at the Phillips Collection in Washington D.C. and won top prizes in several competitions, including the 2012 Washington International Competition, the 2012 Juilliard Concerto Competition and the 2011 Michael Hill International Competition. She is married to Cincinnati Symphony Orchestra cellist Hiro Matsuo, with whom she founded the 2M Duo. Marten has been Acting Assistant Concertmaster since 2017 of the Kansas City Symphony, where he played in the first violin section since 2016. He has a bachelor's degree from Rice University, where he studied with Cho-Liang Lin; and a master's degree from the University of Southern California, where he studied with Glenn Dicterow. The CSO will hold auditions later this month for a section viola player and Assistant Principal Horn, with other auditions to take place later in the season.